Marvin Lipofsky earned his BFA in Industrial Design from the University of Illinois, followed by an MS and MFA in Sculpture from the University of Madison, Wisconsin, where he was one of Harvey Littleton’s first graduate students working in glass art. 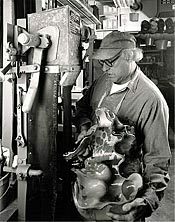 Marvin Liposky went on to introduce glass as an art form into the Design Department of the University of California at Berkeley, and to found and head the California College of Arts and Crafts, where he taught blown glass art for many years. Many of Lipofsky’s students in California have gone to become famous blown glass artists in their own right. Lipofsky has travelled extensively to work with the best blown glass artists in the world, creating collaborative sculptural works as well as gathering inspiration for his own pieces. Many such trips abroad to work with other blown glass artists occurred while Liposky was still teaching at California College of Arts and Crafts. 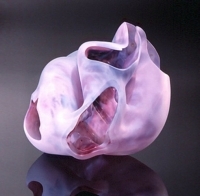 Marvin Lipofsky’s blown glass art is always very organic in form and usually multi-colored. The recipient of numerous international awards, Lipofsky’s blown glass works can be found in many collections, including the American Crafts Museum, New York, the Corning Museum, Corning, New York, the National Museum of Modern Art in Kyoto, Japan, and the Stedelijke Museum in Amsterdam. Marvin Liposfky died in early 2016 but he will long be remembered as a pioneer in blown glass art.